The app that allows you to capture life's moments with your smartphone is a convenient way to share your favorite places. Photographer and Indiana University Professor Claude Cookman says our variety of landscapes and changing seasons are why residents and tourists alike can't resist exposing a few pixels. "Instagram is really interesting because of its square format, which differs from our actual field of vision," says Cookman. We pored over Instagram hashtags to pull together eight shots that define our region. This architectural wonder in the once-utopian community of New Harmony was designed by resident Philip Johnson. The actual church is an open park with this shingled dome at one end and just the sky to serve as the roof. We're famous for our gorgeous fall season, and you have to get a photo before it passes by. The perfect place to capture all of autumn's colors is the 110-foot-tall Hickory Ridge Fire tower in the Charles Deam Wilderness. The Stock-heughter Covered Bridge in Oldenburg couldn't be more picturesque. Painted "fire engine" red and crossing over Salt Creek, it's no surprise it's often featured in wedding photos, senior pictures or a good old-fashioned nature gram. Since Indiana is one of the top five corn-producing states, capture a field on one of the rolling hills near Oldenburg on the 4th of July -- when the corn is knee high. 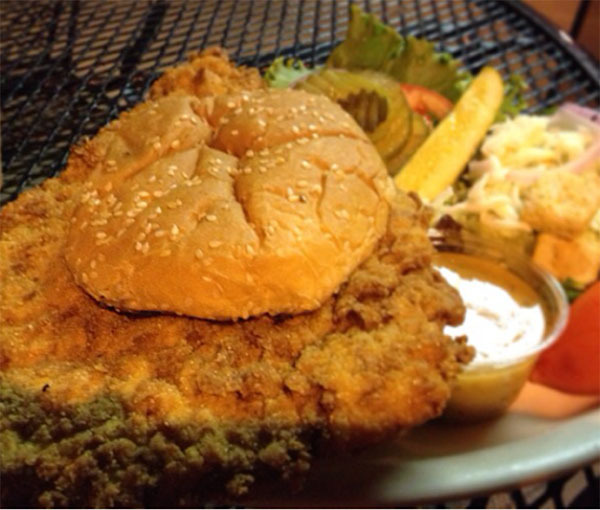 While in the hub of this fried filet, you have to be "that" person photographing your meal before devouring. Stop at Gnaw Bone Food and Fuel in Brown County for their take on the famous sandwich. It only took a mulberry tree growing out of its tower to make it famous. Tourists have been flocking here since the 1870s when it was just a sprout. Stand in front of Storie's Diner on Main Street to get the best shot and grab a piece of sugar cream pie while you're there. Nothing says Southern Indiana more than a small town parade rolling down the street with homemade floats. The town of Pekin boasts the longest running Fourth of July Parade in the country. Or stop by Strassenfest in Jasper. Southern Indiana limestone is the highest quality quarried in the country. Head to Bedford to grab a gram of this geological masterpiece.